It looks like Mr. Linky isn't behaving at the moment. Hopefully that's a temporary thing. 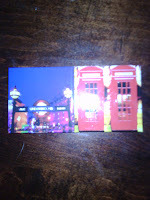 First up, two magnets of London, both from the Tower of London. One is of some phone boxes and the other is of the a London Underground sign. goes to Semi Professional Muse for Hire's review in March of Tales of the City. Next up are two book marks, also from the Tower of London. 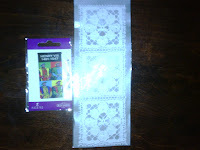 One is Lace and the other is a Warhol-ized version of Henry VIII. These are off to FleurFisher for the April review of South Riding. 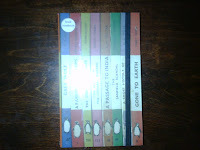 And finally, we have a lined notebook with an image of classic Penguin spines, from Foley's Bookshop in London. It goes to A Hazra's April review of Catcher in the Rye. If everyone who won could email me mailing addresses in the next week, that'd be great! Keep reading, more prizes will be coming at some point! Hey! I'm so very sorry for the delay; I replied as soon as I saw your mail. Thanks so much for the notebook, it looks really lovely.